Our finest range of stabling, constructed to a very high standard to ensure an exceptionally long life. 3.60m x 3.60m " "
4.20m x 3.60m " "
Various size tackrooms, feed stores, etc. Cladding 22mm (7/8”) tongued and grooved tanalised boarding secured to 75mm x 50mm (3” x 2”) and 75mm x 75mm (3” x 3”) frame, all sections are bolted together. Gable ends are fitted with louvre vent. Tongued and grooved boarding on 150mm x 50mm (6" x 2") and 75mm x 50mm (3" x 2") purlins, bolted and fully sectional. Covered with high performance Hyparoof polyester green mineral roofing felt as standard, with the option of felt SLATES or Onduline. Underdrawn with tongued and grooved dip treated boarding, complete with draught free air vents. Size 1200mm x 760mm (4’ x 2’ 6") with top inopening. Primed white and glazed with perspex whole window protected with galvanised bars. Complete with heavy duty 610mm (24") galvanised hinges, kickover bolt, pad bolt, hook and eye to bottom door. Top door complete with pad bolt, hook and eye and magnetic catch. Anti bite strips and door frame protection. Delivery and assembly is FREE to most areas. 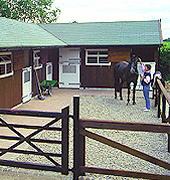 We use only top quality materials in the manufacture of all our equestrian buildings. We reserve the right to change the specification to improve or use our suppliers product availability. Timber sizes stated are nominal, i.e., before planning and or to Canadian lumber standards. Photographs in this brochure may include customers special requirements and are only used as examples of our workmanship.